Today is Monday, September 15 and it’s my 35th birthday! HOORAY! I realize I’m a little older than the average Disney/lifestyle/wedding blogger and some might think it’s a little weird for me to shout out my age, but the truth is, the older I get the more proud I am of the years I have lived. Every year and every day is not guaranteed, and with every birthday I’m grateful for another year of fun memories. A lot of people feel uneasy about turning 30, including me. I spent much of my 30th birthday feeling depressed about entering a different decade and didn’t want to do much celebrating. Now I look back on it and feel so silly! A lot of my friends told me my 30s would be awesome and they were right. So far in my 30s I got engaged and married, earned my college degree, bought a house, visited Europe, started a new career, and those are just the things I can think of off the top of my head. 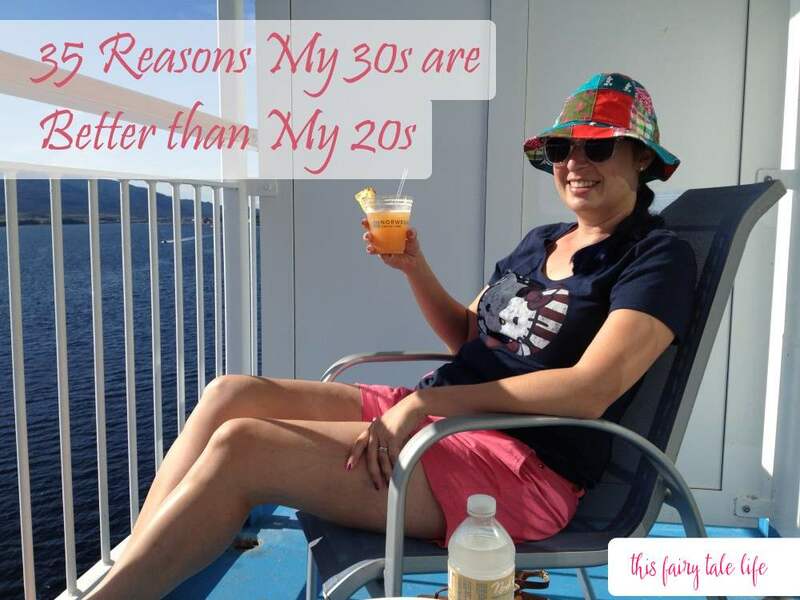 To celebrate my 35th birthday, I put together a list of 35 reasons my 30s are better than my 20s. I thought it might be tough to actually come up with 35 items but it was easier than I expected! How many of these can you relate to? 1. I’m so much more confident than I was in my 20s. I’m simply more comfortable in my skin and it translates into visible confidence. 2. I am more financially secure. When I turned 30, a good friend told me that being in your 30s is a lot like being in your 20s but with more money. For the most part that has turned out to be true. The older you get, the more your skills develop, the more you are rewarded. But also, the smarter you are with your money. 3. I go to Disneyland a lot more. And I went to Disneyland A LOT in my 20s. I think it is due to becoming friends with more people who possess Disneyland annual passes. 4. I’m happier with my job. In my 20s I was working just to work. Now I feel I’m working with passion, and my jobs are much more rewarding and fun. 5. I take less crap from people. I have no time for bull—- … so shovel it yourself! 6. I’ve experienced loss and know I can come out of it okay. 7. I’m an aunt! When I was in my 20s I didn’t have nieces, and now I have two! Having them in my life is such a blessing and I love being “Uncle Mindy” and corrupting their minds with the cult of Disney. 8. I know what kind of clothes work for my body and I waste less time and less money while shopping. I’m still working on finding my perfect personal style, but as I get older I realize I can’t wear certain things/colors and I make less impulse fashion purchases. 9. I know how to cook more than just Ramen noodles. 10. I work out more efficiently. I hit the gym a lot in my 20s but I didn’t really know what I was doing. Now I have a routine down when I work out at home … yoga, weights, jumping jacks, rinse, repeat. 12. My phone keeps getting better. This is a superficial one. But yeah, it’s cool that in my 20s I had a huge cell phone that only made calls, and now I have a slim tiny computer in my pocket that counts my calories when I run and dictates my to-do list. Oh, and also makes calls. 13. I’m traveling more because I’m making it a higher priority. I want to see the world and I’m realizing if I wait too long, I may run out of time to see everything I want to see. 14. I’m smarter about what I eat. Finding out about my food intolerance and allergies was huge. It’s a challenge and it’s not fun but I’m still glad I know, because I feel so much better. 15. I make fewer bad decisions. I find when I have to make a big life choice, I really think things through. Not to say I’ll never make mistakes. I make mistakes every day. But for the big things, I believe I’m approaching them in a more wise and thoughtful manner. 16. Vela! Awww my sweet Vela kitty. My angel kitty Walter helped me through my 20s and I know Vela will be there for my 30s and beyond. 17. Even though I’m in my 30s, I still get carded often when buying alcohol. I’m guessing that’s going to happen less and less so I’m reveling in it while I still can. 18. Speaking of alcohol, I get drunk less. It still happens once in a while. But not as much as my 20s. 19. Speaking of alcohol again, I’ve grown to love wine and I love trying new varietals and tasting them, even though I’m still not one of those people who are like “hmmm, this one tastes oak-y,” but I feel like I appreciate it more. 20. I’m taking more risks. Things like flying in a helicopter and switching careers, things I would have been scared to do in my 20s. 21. I’m better with makeup. Not good, just better. 22. I have more patience. In my 20s everything was HURRY HURRY HURRY, LET’S GO LET’S GO. I still approach everything with urgency but I find I’m more patient in long grocery lines, in crowds at Disneyland, and things of that sort. 23. I’m braver with trying new foods. 24. I’m learning I can’t control everything. 25. I have a better work ethic. Perhaps this comes from experience, or from loving your job. 26. I’m less depressed. Again this could be related to all the other wonderful securities I’ve mentioned already, but I feel like the older I get, the more I’m in control of my depression and anxiety. I have some really good doctors right now who helped me find the right meds and are steering me towards good life habits. And of course I have the world’s most patient and supportive husband. I have my days, but I’m having less and less of those days. 27. I’m more aware of current and political events. 28. I have amazing friends. I’ve been blessed with wonderful friends through the years, but I’d say right now I’m the happiest I’ve ever been in the friend department. 29. I love where I live. I lived in some dumpy areas while I was young and broke. I love living in Burbank, so close to the Disney studios! It’s like a dream. 30. The older I get, the better I am at painting my nails. 31. I’m more comfortable in bed. If you know what I mean. Practice makes perfect. 32. I’m not ashamed of the things I love … Disney, Hello Kitty, Taylor Swift songs, rainbow sparkly unicorns? MORE PLEASE. 33. I’m treating my body better. Less sugary sodas, less coffee, more water. More working out, less laying around. More high quality food, less frozen pizzas and drive-thru. 34. I’m not a better dancer than my 20s, but I dance “like I just don’t care” more. 35. Even though I have more, I feel like I need less. I’m constantly looking around and thinking, what can I purge? When I was younger I was all SPEND SPEND SPEND WHEEEEEE and now I’m working towards quality over quantity. For those of you already in your 30s (and beyond), do you agree? What can you add to the list? Ha! – “The older I get, the better I am at painting my nails.” Truer words have never been spoken! I also find that in my 30’s I am way beter at removing the polish before my nails look like they got into a fight with a cheese grater. Haha, I actually find I leave my polish on longer because I’m so busy I don’t have as much time to do my nails like I used to. Thank you! Great list, Mindy! Reason #1 is also the prime reason I’m having so much more fun in my 30s than I did in my 20s. Having confidence in yourself and to ignore all the haters just makes you so much happier!